Holy Basil, also known as Tulsi, is possibly one of the most beneficial herbs available for human consumption. Touted as miraculous, and known to have been worshipped in India for thousands of years, Holy Basil, also known as Tulsi, is likely one of the most beneficial herbs available for human consumption. Ayurvedic medicine enlists holy basil for a plethora of health and spiritual concerns, from colds and flu, to fortifying one’s powers to protect and purify. How much is myth and how much is truth becomes irrelevant once you experience the sublime results of drinking a cup of Buddha Teas Holy Basil Tea. What Exactly is Holy Basil? In Hinduism, the Tulsi plant, or Holy Basil, is deemed the most sacred of plants, and is thought of as the physical manifestation of the goddess, Tulsi. In traditional Hindu homes, Tulsi is centrally planted inside courtyards. As Tulsi is considered to both spiritually protect and physically heal, one can easily understand the significance given to this remarkable herb. Holy Basil is considered an adaptogen: “any of various natural substances used in herbal medicine to normalize and regulate the systems of the body.” (Dictionary.com) Adaptogens are a special category of healing plants; they are meant to help balance and restore the body. Though there are various popular adaptogens utilized in the growing field of alternative medicine, holy basil is a super power, and often deployed by Ayruvedic practitioners to combat the damage accrued by living with the everyday stresses of life. What Does Buddha Teas Holy Basil Tea Taste Like? 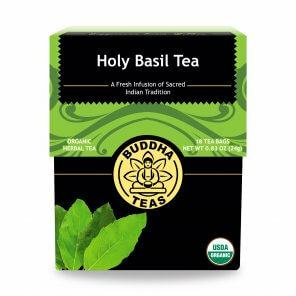 If you imagine your Buddha Teas Holy Basil Tea is going to taste like a cup of pesto, you would be wrong. Far from the savory Italian yumminess of a pasta sauce, our Holy Basil Tea spreads across your mouth like a slightly sweet, somewhat spicy surprise. Hints of clove, and a windswept pirouette through earthiness, we find the taste grounding, yet elevating. 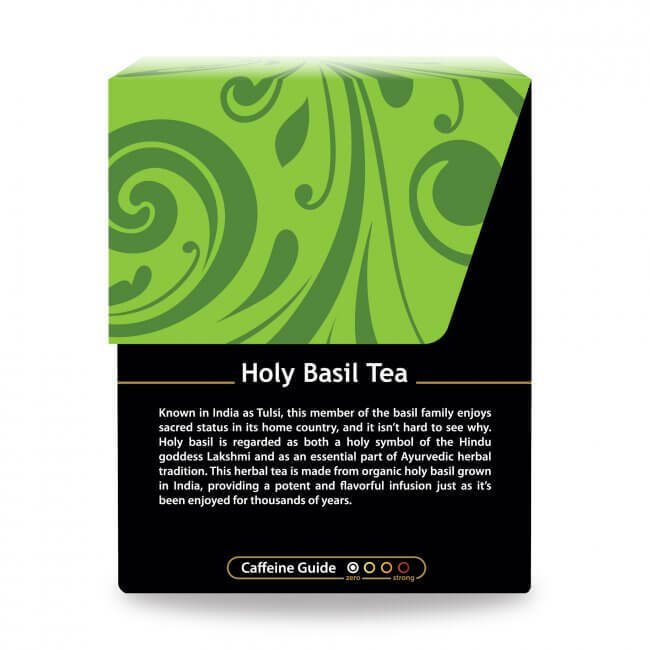 A truly well-rounded tea experience, we think you’ll agree one sip of Buddha Teas Holy Basil Tea will elevate the moment, and leave you wanting more. Very good!! It doesn't taste like basil, it's hard to explain the flavor but it is very enjoyable for sure!! 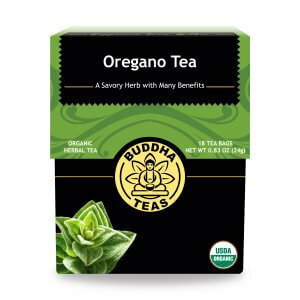 I started drinking this tea when I was recovering from a cancer surgery and it was remarkable how much I felt this tea helped in calming me. I experienced better digestion and immunity! One of my favorites; it has a calming affect in me, and it tastes amazing. I drink this tea daily. In fact, I brought it with me to Disney World! This tea helps me in so many ways, namely my anxiety. Glad I found it and thank you Buddha Teas for making it! Very relaxing. I like to inhale the steam as I sip to maximize the effect. 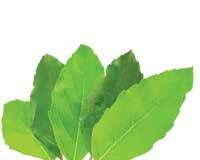 Holy Basil as well as Nettle and Eucalyptus teas have helped me control my Blood Sugar. 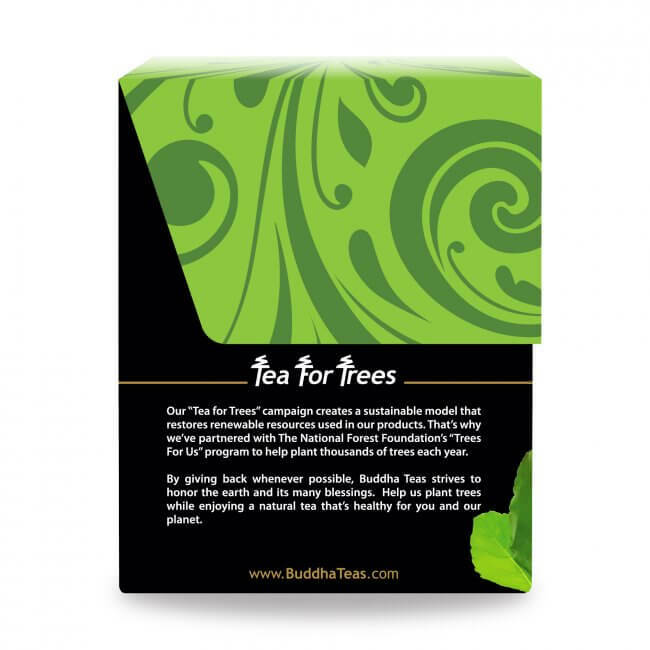 I have a number of Buddha Teas and love them all! Review Title: Quality and Customer Service! This has become one of my favorite herbal infusions. The leaf quality of the tea is very good. Sometimes I add a splash of rosewater too! 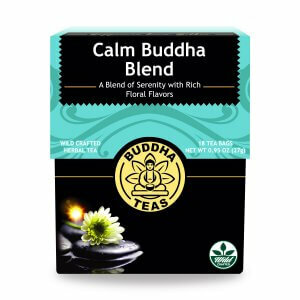 I I appreciate Buddha Tea's attention to the range of medicinal plants from different traditions. Keeping it simple with with well-selected single ingredient herbal teas is also something I appreciate. Customer service is excellent. Any problems and they respond right away and make it right. Small businesses like this have my support! I didn’t know what to expect with this tea, but I love the flavor. It also has a lot of health benefits, which is why I drink tea. Holy Basil is my favorite way to calm down and relax after all the worries of the day. I like it with honey to satisfy my sweet tooth but it is also good just on its own. I can get 2 large cupfuls out of one tea bag when I make it in a teapot. Carries me through the evening and into the next day.